Pro Vitamin Complete's Liquid Vitamin supplement is a great way to provide your body with all the vitamins and minerals that your body needs to survive. Liquid vitamins provide a 90% absorption rate on the cellular level compared to 40% with standard pills. 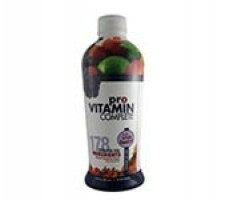 Pro Vitamin Complete - 30oz Btl.The Most Important Thing You Can Do For Your NourishmentInstead of r..